AUBURN - Normand J. Verreault, 91, died on Monday, Jan. 21, 2019, at Clover Manor Health Care Facility. 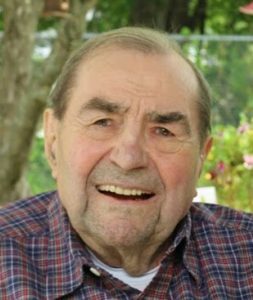 AUBURN – Normand J. Verreault, 91, died on Monday, Jan. 21, 2019, at Clover Manor Health Care Facility. He was born on Nov. 17, 1927, to Joseph and Yvonne Verreault and was the sixth of 12 children. At age 17, he volunteered as a merchant marine and traveled the world. Then he entered the Army and served in post war Germany for two years. After returning from service, he married Corinne Gardner on Nov. 11, 1952, at Saint Peter and Paul Church and they made their home on Green Street in Lewiston for over 60 years. Norm then started his 60-plus-year career as a plumber, the last 14 years of which were at St. Mary’s Hospital in Lewiston. Plumbing was his calling and his hobby. Norm was an extrovert who called everyone he met a friend, an eternal optimist who saw his glass as full to the brim and running over, and a conscientious landlord. He was exceptionally generous and could fix anything. He is survived by his beloved wife of 66 years, Corinne; and two grateful children, Marc and Anne Ross, as well as Marc’s wife, Anne Herzenberg and Anne Ross’s partner, Clyde Wentworth; grandchildren, Ben (fiancé, Liz May) and Adam (wife, Annette); great-grandchildren, Nathanial and Samuel; brother, Roger and his wife, Sylvia; sister-in-law, Alice Grover and over 40 nieces and nephews. A funeral Mass honoring Normand’s life will be celebrated on Monday, January 28, at 11 a.m., at Holy Family Church. Committal services will then follow at St. Peter’s Cemetery. Visitation will be held on Sunday, January 27th from 2-5 PM at the Pinette Dillingham & Lynch Funeral Home 305 Alfred A. Plourde Parkway in Lewiston.